* Each track follows a weather pattern over the course of the 3-month season. Your Local track is the home of your stable (and many others), and is the venue for your weekly Class league races. (See Class Races) Up to 150 human-owned stables can call each track home, with 25 stables competing against one another in each of the 6 classes of racing at each track. 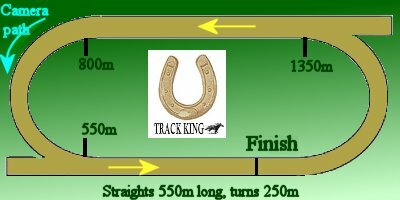 On entering Track King as a Stable Manager, your stable will have been assigned to a Local track. Local Tracks have a Prestige Rating, which is a guide to how many players reside at that Track in Class 1,2 or 3. The higher the Prestige level for a Track, the more likely that Track is to schedule a Local Cup Day. The track is also home to a resident tipster, an virtual equine expert who doesn't mind a bet or two - sometimes he'll offer his choices for race favouritism in the betting stakes. Check each individual race page before the event to check his early mail! Maybe he knows something you don't? Each track has it's own weather, which is updated every day. On each Track page you can see what the weather is like today, and a weather forecast for the next 7 days. As we all know, the weather forecast isn't always entirely accurate, but they get it right quite often. The weather isn't selected completely at random every day. It's connected to what the weather was like the day before. If there was rain today, there's a greater probability of rain tomorrow as well, compared to other types of weather. The chances are exactly the same for rain, sunshine or anything else regardless of which track you choose. No tracks have better weather than others. You may also notice that each continent has its' own "Weather patterns", with each real-time month marking the start of a new Weather pattern. Pay a little attention and over time you may be able to predict where the wet and dry tracks are likely to be at any time of the year. There are three different Weather patterns - Hot, Wet, and Average - and they always follow each other in that order. The only thing that isn't known is which of those Weather Patterns that each Continent will start with at the beginning of each new racing season. The weather affects track conditions, which in turn affects the performance of your horses and jockeys on race day. To be a truly successful Track King, you'll need to be able to predict how the track will respond to the coming weather so that you can be sure to enter your horse into races where the track condition is likely to suit your steed. As most horse trainers and keen punters know, a stretch of hot sunny weather or a spell of rainy days can really affect the condition of a racetrack. The horse racing tracks in the game reflect this, with subtle changes the result from the weather conditions. Some horses perform better in heavy going, some horses prefer faster track conditions. Some horse skills are more useful on heavier or drier tracks, and some qualities of a horse are consumed faster in heavier conditions than on good and fast tracks.